Part of the fun of being a STAR DEN member at a LC Symposium (or any other Discovery event) — the prizes. No other organization gives you tomorrow’s tools today, and nowhere will you find a greater group of people. So, yesterday evening, after our luau-themed dinner event, we played DEN-GO (DEN’s version of Bingo, but much funnier), card games, and Wii. Each time you won, you got tickets for prizes, and there were plenty to go around. Meg Griffin, PA Chair, won a floating globe. I won what I really wanted, a Military Channel hat for my husband, a fan. Not all the PA people won prizes, but Patti Duncan, Events Chair, said it best: “Because of the fantastic networking and bonding, we all came away a winner.” Robin Martin, PAs newest blogger, was maybe the most excited winner of the event. Her “I’m a winner” dance was priceless. So is the photo. If a picture is worth 1000 words, then I’m already over limit. 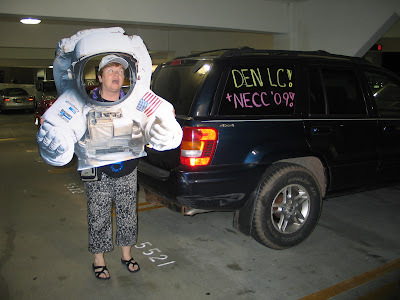 It’s great to hear about your DEN LC adventures – I miss being there this year. You are all winners! !